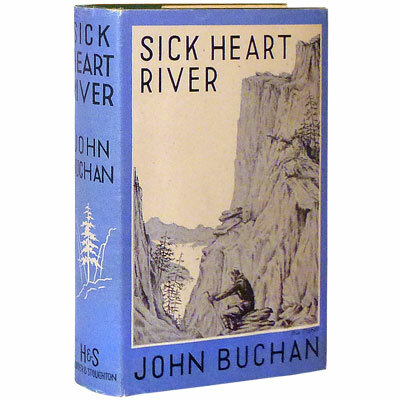 Sick Heart River - John Buchan 1941 - Hodder Stoughton Limited, London - First Edition	A fine first edition of Buchan’s last book, published posthumously. The fictional Sick Heart River is in the real region of the Nahanni River in Canada's Northwest Territories. It is in some of the most rugged terrain in Canada. The area was only just being mapped when Buchan, as Governor-General Lord Tweedsmuir, passed nearby during his voyage down the Mackenzie River in the summer of 1937. Having heard much about the mysterious South Nahanni, Buchan was fascinated by it and wanted to go there, but did not make it before he died in February, 1940. [Galbraith, 2001]	John Buchan (1875-1940) was born in Perth, Scotland and educated at Oxford where he published five books and won several awards, including one for poetry. He went on to be a barrister, a member of parliament, a soldier, a publisher, a historical biographer, and - in 1935 - he became the Governor-General of Canada. Today he is best remembered as the author of his perennially popular adventure novels. Provenance: Small inscription of Phyllis M. Havercroft to front endpaper. Reference: The John Buchan Society.